As if I wasn’t already excited enough to have a whole evening dedicated to one of my most favourite design subjects, Jamie introduced the Royal Mail Special Stamps Commissioning team as the most committed client he has the pleasure of working with – my joy was off the scale. The talk appropriately titled ​‘Design in Miniature’ did the very opposite – thanks to technology, we could look at stamps that we’ve seen many times before with fresh wide eyes, on a screen enlarged by a gazillion percent. Marcus James, Catharine Brandy and Dean Price are three members of the Stamps and Collectibles team, responsible for the design and production of all the British special stamps today. As the biggest commissioner of Art in the UK today it falls on their shoulders to commemorate and celebrate the UK and all our national character. Keeping the designs fresh, relevant and engaging for both new audiences and regular collectors. Marcus started by showing a short film featuring a very dapper looking David Gentleman who talked through the process of designing the beloved set of Concorde stamps from 1969 – using cut-paper to create the shapes as the pencil gave ​‘too woolly’ a line. And then followed with a brief history of the Special stamps themselves. In 1965 the then Postmaster General, Tony Benn, and designer David Gentleman produced a set of stamps depicting Winston Churchill this set launched the Special Stamps programme we know and love today. Benn also at that point revised a set of principles that still hold true today, special stamps will: celebrate events of national importance; commemorate national anniversaries; reflect Britain’s contribution to the arts and world affairs; and extend public patronage to the arts. 2015 saw the 50th anniversary of the special stamps and correct as of the day after our talk, [thanks to Dean Price for the calculation] if you owned all of them today you’d have a collection totalling 2,663 stamps — now that would be an epic and eclectic collection of art and design. Where else would you see David Hockney next to Sarah Fanelli next to Alan Kitching next to Bridget Riley? Have a look at the 48 Millennium Stamps, a beautiful set created by 48 different image makers, under the guidance of the Special Stamps team and designers Kate Stephens and Mike Dempsey of CDT, visually interpreting the past 100 years — that is one hell of a brief. To create any set of stamps is a well organised process between one to two years long, the team use a multi-commissioning approach with three or four agencies or artists asked to pitch ideas at the first stage. Each pitch stage is paid and everyone is paid the same fee, a wonderfully democratic process. Don’t mention the ​‘R’ word though — there is no design roster. Which means the commissioning team are free to source any designer or artist they see fit to tackle the subject matter at hand and they can also choose the right specialist for each commission. At each stage, all the designs are presented to the Stamp Advisory Committee [SAC] which is made up of designers, philatelists, professors of design, members of government. The SAC having the ultimate say on which stamps go through to the final artwork stages. And last, but by no means least, the Queen approves each stamp design. The stamps themselves usually go to print around six to eight months before they’re released and several ​‘essays’ are printed and proofed before the final run. 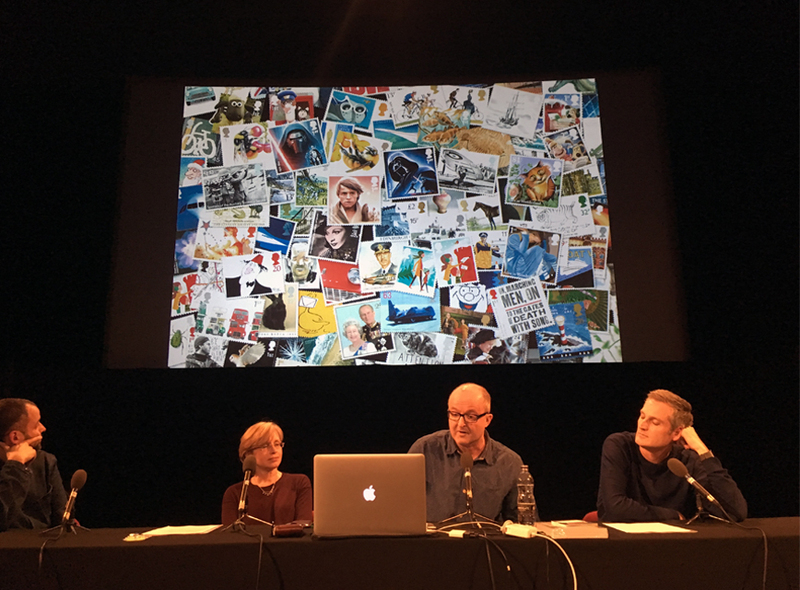 All three speakers then went on to share some of their favourites and we heard the wonderful background stories from problems with a very different sort of leading on the 2015 Christmas stamps celebrating stained glass to searching out an original Mary Quant dress. We heard about how the hat-trick commemorative poppy stamp was perfectly formed from the first pitch to a set marking the 400th anniversary of Shakespeare’s death in 2016 taking longer than anticipated to get the typography crafted to perfection to truly reflect the words they were celebrating. It was lovely to hear stories of agencies challenging the brief which must be harder to do so with such a prestigious client, but True North did just that when given the brief ​‘can you design 10 stamps to celebrate 150 years of the FA?’ No, they said, but we can design 11. Johnson Banks paved the way with the out of the stamp box designs (breaking the traditional perfed edges) with their interactive fruit and veg stamps breaking away from the rectangular restrictions and more recently Osbourne Ross created their Animail stamps playfully wrapping around the envelopes of our birthday cards. No other talk in the WEDF history has managed to make so many local references a mere perforation away from each other. We started with Tony Benn, moved onto Concorde, Hannah Moore, Wallace and Gromit and even Agatha Christie was married at Clifton College. With just one notable exception of the building we were in – The Arnolfini featured on a stamp in 1984 but we’ll forgive them, won’t we? It was lovely to see the work of several of our past speakers GBH, The Chase, hat-trick and Why Not Associates. It would also be very remiss not to mention the fabulous Mr Men and Little Miss stamps celebrating the 45th anniversary of the series they were designed by Supple Studio in Bath working alongside Roger Hargreaves’ son, Adam. The case study on Supple’s website perfectly highlights the ​‘accompanying philatelic products’ that are designed alongside the set of 10 stamps, a stark comparison from the additional first day cover of the Why Not Associates stamps of 2004. And we’ve already had a sneak-peek of some of the work of our speaker on 18th January, Jim Sutherland from Studio Sutherland with the Agatha Christie stamps celebrating the centenary since her first novel and marking the 40th anniversary of her death featuring everything from hidden secrets using 0.2pt microtext to UV and thermochromic ink – well, you’d expect nothing less to celebrate the Queen of Crime. So, next time you post a letter or a card, not only are you buying a small square of paper capable of global travel you’ll be looking back in time at about two years’ worth of work and understand the process that got it to your envelope today. Thank you to Marcus, Catharine and Dean for giving up their time to come and share their stories and thank you to Royal Mail for always, and without fail, crediting the designers and image makers that create these objects of beauty, perforated for our pleasure.